Oh Happy Birthday - Nobody Send Birthday Cards These Days! True? Oh Happy Birthday believes in sending paper birthday cards and celebrating every birthday. Everyone is unique and special. Likewise, every birthday! Therefore, celebrate every birthday! And most importantly, do not stop sending paper Happy Birthday cards! every card has the power to promote self-worth. each card has the power to impact life drastically. every birth deserves to be celebrated. every person is uniquely special and somehow is intrinsically associated with his/her birthday. So don't stop celebrating with a paper birthday card. No ecard, please. Do not shortchange the birthday boy or girl. Send a real card always! 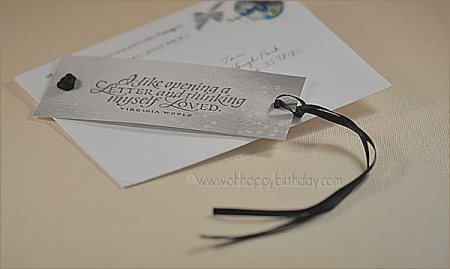 It might be just a piece of card stock with a simple design but don't underestimate its power in making the recipient feel wanted, special and loved. The above words by Virginia Woolf speaks clearly of the wonderful feeling of receiving tangible mails in our letter-box and the act of opening them. We might not be writing letters; but handmade or printed happy birthday cards would do the same and more for the person receiving it. My prayer for every birthday card I made and send is that the recipient of each handmade card knows that he or she is deeply loved and highly favoured. And that is enough reason for me to spend the extra time creating it. It works both ways --happiness for the one sending as well as the one receiving. Someone wrote; "What I'll remember most about my birthday is that you forgot it." And here's another one. "If it wasn't for Facebook, nobody would remember my birthday." Facebook's birthday notifications do help a bit but not all people submit their true birth dates when they signed up for a Facebook account. And though our friends on Facebook might post birthday greetings, I believe it cannot beat receiving a paper Birthday greeting card in your mail box with words like; "Oh Happy Birthday!" I am not selling you anything. This site is a labour of love. The information on this Oh Happy Birthday website is free. Oh Happy Birthday believes in the power of a store-bought or handmade birthday greeting card and want to encourage you to join me in making and sending happy birthday greetings to friends, family and business associates; celebrating each birthday with heartfelt warm and happiness. I understand that buying beautiful birthday cards can be costly. Hence, I'm here to help you by providing some free printable birthday greeting cards which you can download to your computer and print on a colour printer. Don't worry if you feel that you are not artistic. Simple step by step instructions will be given so you can easily follow along. 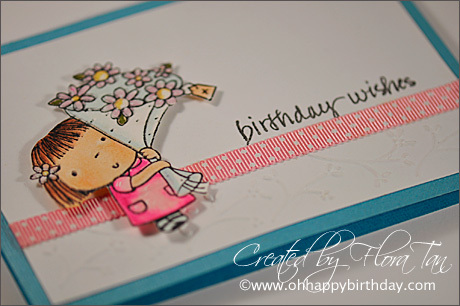 Thinking you would like to make your own cards but don't know how and where to start? Card designing as well as card-making techniques will be covered thoroughly with photographs. As much as possible, I will also digitally create necessary templates for you to download for your personal use. In case you need birthday card's design or layout ideas, a gallery collection of handmade birthday cards I made myself or received from friends on birthdays will be posted here on www.OhHappyBirthday.com - a website totally dedicated to making Happy Birthday cards and birthday party invitations as well as other necessary information about how to make the birthday card's recipient dancing with joy and feeling much loved. So let's begin to send birthday wishes; bringing joy one birthday card at a time. Top of Oh, Happy Birthday!